Program: Welcome breakfast, short walk around the house (picking greens, fruit or fresh herbs if available), hands-on cooking class, nibble with local/regional wine, three course meal with local/regional wine, sobremesa with tea or coffee. Recipes will be sent by email so you can recreate the dishes at home. Available any day of the week all year-round by reservation except July and August. The menu can be adapted to accomodate any food restriction you may have. The cooking session is focused on traditional Spanish and regional cuisine. The menu is seasonal and market-inspired, and we will prepare together an appetizer, a starter and a main dish from the scratch, with a home cooking approach and plenty of opportunity for everyone to participate. You will also discover and taste delicious local products or homemade treats along with local or regional wines. Dessert is prepared in advanced. But first of all we will sit around the table for a welcome breakfast while introducing ourselves and explaining the day’s program. The beautiful surroundings deserve a short walk around the house to connect with the place and pick some natural ingredients that may be available before we grab the aprons and start the instructive and entertaining hands-on cooking session. Once the cooking is done it is time to sit and relish the food just prepared, the wine and the relaxed conversation around the table. We eat outdoors everytime possible, and streching on the “sobremesa” with some more tea or coffee is a must. welcome and enjoyed meeting Mayte’s parents and Coco. A trip to Malaga area would not be complete without a visit to Mayte’s kitchen. Like others before me, spending time with Mayte in her farm house learning about Spanish cuisine, was indeed the highlight of my weeks holiday in Málaga. Quality of food and mind is refreshing in an over commercialised world. If you wish to experience something genuine, then I cannot recommend Mayte´s Cooking Day enough. The ambience is so much appreciated. Enjoyed the lunch, cooking Salmorejo, Soupy Rice with Fish. If I close my eyes, I can still taste the local red wine, delicious. Meeting family members and Coco. Thank you so much Mayte. We were a party of 6 Swedish people who spent a cooking day with Mayte. We had a very pleasant day together with her and her friend, learning about Andalusian cooking and culture at her lovely house. For us who don`t speak Spanish it was very good that Mayte`s English is excellent. We can definitly recommend a visit and will certainly be back to her with other guests. We were with Mayte for a Sunday lunch. We were well welcomed and got a little history about the house and location, we got to meet the family that was very nice. Mayte made us feel welcome and at home. She served delicious food along with excellent wines. The atmosphere was relaxed and informal. This we can recommend most warmly. 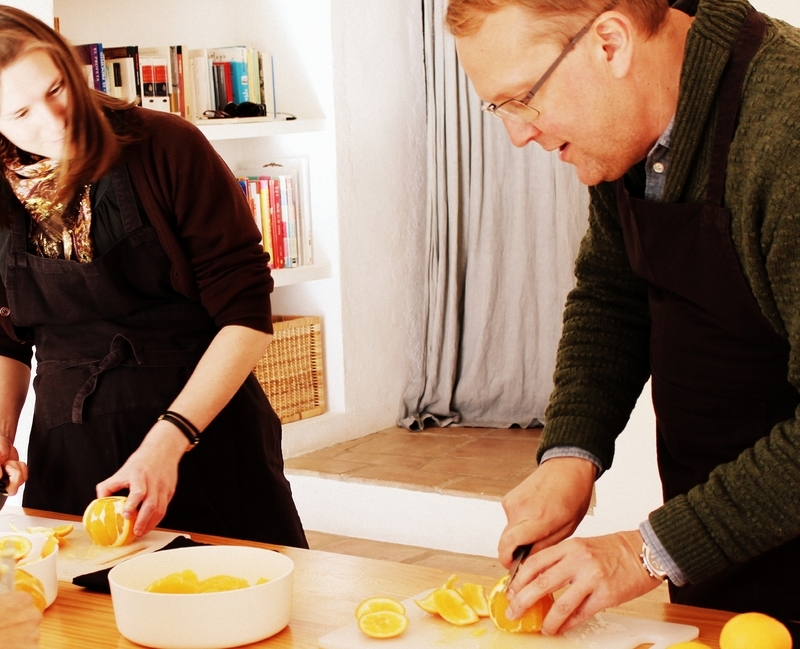 The cooking day was one of the highlights of our Andalucian visit. We had a splendid day with Mayte! We very much enjoyed the whole day. Mayte is a welcoming hostess and she is sympathique, educational and easy to talk with. If you want to know anything about Andalucian tradition you can certainly get to know it through Mayte. Despite a day full of activity – with cooking and picking fruits in the garden – the pace was pleasant and we felt very comfortable all day long. The ingrediences was locally and ecological and the food was tasty and well-flavoured. The house and its surroundings are worth a visit all by themselves.